Sat. 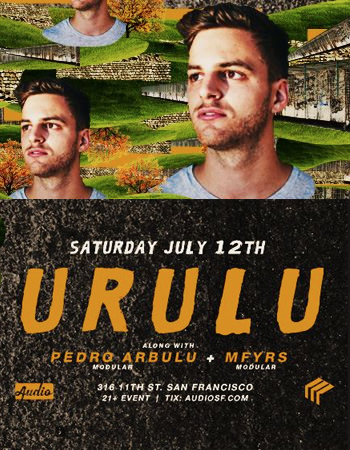 July 12th, We are proud to present rising star Urulu. Making his Audio debut, the man prefers not to be bogged down with sticking to one genre/sub-genre; each release, remix or edit makes a clear statement: this is unashamedly soulful, infectious, warm house music in its rawest and purest form. The LA based, but London-relocated Taylor Freels is well versed in finding a track’s sweet spot. Urulu’s dynamic arrangement instantly struck a chord with peers and fans alike with his sophomore EP “SINCERELY ’91,” on German heavyweight imprint Exploited Records. With subsequent releases on Dirt Crew (DE), Needwant (UK), as well as releasing on his tastemaker imprint Amadeus Records, Urulu utilizes a combination of cerebral, haunting vocal samples, all while infusing luscious deep chords and low-slung basslines. His forthcoming releases include the anticipated release on the forward-thinking label Manucci’s Mistress and a second helping on Jacques Renault’s Let’s Play House (US). Having performed alongside the world’s top electronic artists, such as Moby, Hernan Cattaneo, Tube & Berger and Oliver Koletzki, Pedro has a passion for deep, dark and driving hypnotic music from deep house to tech house.